Before I begin, if you haven't read; To Kill A Mockingbird, go and do it now. You really are missing out on one of the best books of all time. I had my introduction to this author in 2010 and felt like I was missing something, having not read it for so long. I didn't wait to read this one, despite the mild controversy and opinions on it all. I had one comment saying she didn't think Harper Lee wanted the public to read this book. I think if that's true, she shouldn't have written it, or at least made those wishes known. Regardless, I chose to read it, and I hope you do too before you formulate an opinion. Those who disagree might have expected too much from it. 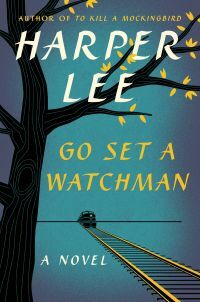 This story gives us a deeper insight into the life of Atticus Finch and his daughter, Jean Louise. Much like the readers of, To Kill A Mockingbird, Jean Louise followed the case, and others her father worked on, believing he was a man of high moral ground. Which he is, but as any man, he is also flawed. So when he is viewed with a different ideal than she is accustomed to, she handles herself rather poorly. The book, and the story itself, still gives us a deep look into racism and the old South. It is still trying to get across the morals of equality, which I believe it accomplished. I'm so glad I read this book. It didn't have the same effect as, To Kill A mockingbird, but it still resonates in me. **No compensation was received for posting. Compensation will be earned if purchases are made from the links within. This copy was purchased. Opinions are owned by this site. While I wouldn't give this one five stars like TKAM, I'm glad I read it too. It's hard to read it and not have all of the hype and news hanging over you as you read. It's hard to believe but I've never read To Kill A Mockingbird. That should be on my list of books to read. I haven't read the so I can not leave a comment with MY opinion. A couple of my friends have read it and were not impressed with it. Just what I heard. I loved TO KILL A MOCKINGBIRD.